Not only was a Chicago-area Christmas package delivered a week late, torn to shreds, and repackaged in a toilet paper box by the post office — it happens — but the container mistakenly included an artifact of national importance. 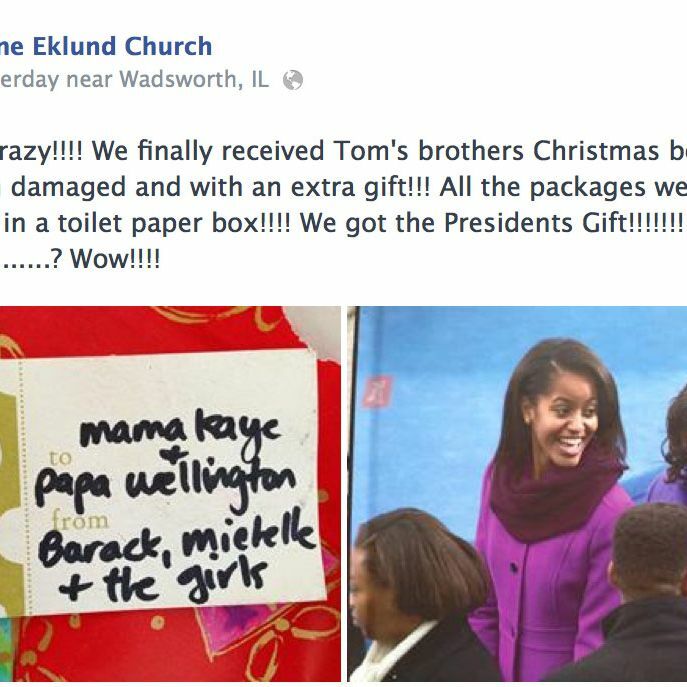 Alane Ecklund Church of Wadsworth, Illinois, opened the box to find a gift from “Barack, Michelle + the girls” addressed to Sasha and Malia’s godmother. Naturally, she went straight to Facebook, and then the Today show. The “very special” photo album, addressed to Mama Kaye and Papa Wellington, was filled with “private moments of their year of 2013 together,” said Church, who declined to show the pictures on TV for fear of ruining the present completely.